Recording his third win from 13 starts, Resurrect (5 g Shinko King – Errant, by Jungle Pocket) presented in terrific condition when taking out the $25,000 Rating 75 1300 metres on Saturday at Tauranga. In showery conditions, on footing rated Dead6, Resurrect appreciated a solid pace set by customary leader Rich Billie Marsh (Viking Ruler), which allowed him to travel comfortably in second and after challenging to lead at the 300m he kept going to win narrowly but well. Owned by Gerard Peterson and Ballymore New Zealand, Resurrect was a $13,000 yearling purchase, selected by Paul Moroney, at the 2014 New Zealand Bloodstock Festival Sale, from the draft of Paxton Park. The third dam in his pedigree, Superior Miss (Bassenthwaite) is the mother of VRC Derby (Gr. 1, 2500m) and Wellington Cup (Gr. 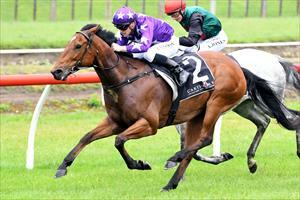 1, 3200m) winner Second Coming (Oak Ridge) who was trained by Mike and Paul Moroney. Second Coming also finished third to his stable-mate Brew (Sir Tristram) in the 2000 Melbourne Cup (Gr. 1, 3200m). In the race sponsored by Tauranga Hardware and Plumbing, Resurrect ran the 1300 metres in 1:18.0, last 600m in 36.0, and paid $6.20 & $2.20 on the NZ TAB tote. Co-trainer Pam Gerard said: “He got a better run today”, having mentioned beforehand that Resurrect, and others in his race last time at Matamata, were caught napping by a smart front running ride. Resurrect was strapped by Pravin Kumar.